Despite offering keen drivers a rewarding experience behind the wheel, this car's predecessor divided opinion when talk turned to its looks. Keen to avoid such controversy – a similar situation occurred with the flagship 7 Series – this 5 Series has been designed to appeal to a wider audience. It's no coincidence that, from some angles, you can see similarities with the smaller 3 Series. That's where the similarities end though, as this 5 Series shares a platform with the larger 7 Series. Itself promoted as a sporting limousine, there's no suggestion that the 5 Series has gone soft. And to reinforce the point, BMW offers a clever driver switchable suspension system in the 'comfort, normal, sport' theme, while there's also a clever active steering and rear-wheel steer option, which does much to boost the car's agility on twisty roads and in town. Fans of BMW's Efficient Dynamics programme won't be disappointed with the 5 Series; the car boasts an impressive engine line-up, with the diesel units offering impressive levels of economy and performance. Low CO2 ratings also feature, and will no doubt make it that bit easier to justify a 5 Series as a company car. For all the car's on-road dynamism, its cabin is more luxurious than ever. Clearly influenced by the 7 Series, the 5 Series boasts new levels of fit and finish plus a tasteful array of wood and leather trim options. The overall layout is a departure from the stark design of its predecessor, and offers more occupant and storage space into the bargain. Some die-hard fans might bemoan the car's noticeable swing towards the luxury end of the scale – the cabin's design and opulent ambience being obvious signposts. But with rivals also ramping up the luxury content, BMW rightly felt it had to compete and it has done so in style. The car's core driving enjoyment values might have changed slightly to reflect this, but by selecting the right options you can tune the car to you liking. And the car's engines are yet again class-leading examples, proving that BMW's focus remains in the right direction. With improvements to the engine range – especially the diesel motors – BMW has brought down the cost of motoring. Lower CO2 ratings and improved economy should see you paying less all-round. This 5 Series is also better equipped than previously, which also makes it a better value proposition. 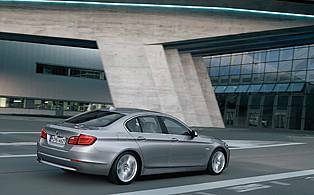 With its slightly enlarged cabin, this 5 Series offers plenty of room for a quartet of adults. Head and legroom in the rear is pretty good for a car in this class, while oddment storage space is plentiful. The car's boot is also a good size, although while it's a deep load space it's not particularly wide. Initially a source of frustration for many, BMW's i-Drive technology has improved over time. It's now become surprisingly intuitive, and controls many of the car's functions: ventilation, audio, sat-nav, telephone. 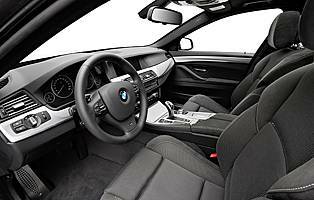 The car's main display and instruments are all up to BMW's usual high standard, while the auto gear lever requires a little practice to be fully comfortable with. With engine and road noise reduced to impressively low levels, it's only the occasional incident of wind noise that interrupts the otherwise soothing cabin ambience. There is no issue over the amount of space in the cabin though, and the driving position offers plenty of adjustment. A popular and desirable car throughout its life, this sixth generation car will be no different. As such, a quality alarm and immobiliser package is available – plus a keyless entry and start feature, while it would be unwise to dismiss a supplementary tracking device if you value your pride and joy. There's no doubting the car's safety credentials. From a full compliment of airbags to a sophisticated electronic traction and a stability package, nothing has been left to chance. This is where the 5 Series has impressed over the years. Delivering a sporty driving experience for the enthusiastic executive has been a major BMW selling point. Some of the overly-firm edges of the suspension have been rounded off this time, the result being a more flexible experience. There's the option of switchable suspension settings if you want the best of both worlds, however. And the BMW's excellent engines – petrol and diesel – don't disappoint. The optional (again) eight-speed auto gearbox is also an impressive piece of kit. There are better cars than the 5 Series when it comes to family duties. The car's plush cabin is unlikely to survive intact in the face of boisterous toddlers. Also, the car's boot isn't as flexible as a people carrier's load space. A 5 Series Gran Turismo or X5 might be a safer bet. If you've got the money there's little wrong with the 5 Series. It's an easy car to drive and, with the variable rate steering, it requires little effort to park. Anyone on a budget might prefer the 3 Series; smaller and less expensive to buy and run, it's likely to be easier to manage on a daily basis. The BMW brand has grown in stature over the years and has become a desirable one to be associated with. The 5 Series, on the other hand, has endured mixed fortunes. The previous model, although a strong seller, divided opinion with its looks. This variant displays and more restrained appearance, and one that's likely to generate wider interest. A little bigger in all the key areas, this 5 Series offers occupants plenty of room. As such, access and egress through the car's front doors is good. The rear door aperture is generous for something in this class, and shouldn't prove an issue for the vast majority of able bodied occupants. The basic offering in the 5 Series isn't so basic, and includes Bluetooth mobile phone compatibility – something all executives on the move should appreciate. Located high up in the fascia, the unit's display is easy to read and the i-Drive controller is no much improved. The optional Satellite navigation works well on the big screen, and there's the likes of digital radio and MP3 music player connectivity to choose from. With only a modest amount of chrome trim punctuating the car's exterior, it's left to the car's sculptured sheet metal to catch your attention. Surprisingly for an executive car, lighter hues work best, as darker colours mask the many exterior details. The opposite is true inside, with darker fabrics and trim materials setting the right tone. Although a big car, once you're familiar with its dimensions parking rarely proves to be a challenge. The included parking sensor certainly help, while the optional active steering function greatly reduces the effort required. The optional reverse parking camera – with the view displayed on the car's main screen – is an added bonus. 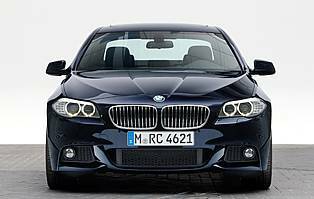 Petrol engine options – 523i (204bhp); 528i (258bhp); 535i (306bhp); 550i (407bhp). 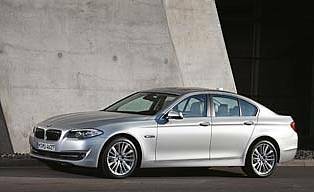 Diesel engine options – 520d (184bhp); 525d (204bhp); 530d (245bhp). Transmission options: six-speed manual gearbox, plus optional eight-speed auto gearbox (standard for 550i). Trim levels: SE.